Hitting the Australian waves and pristine river ways with your pooch is becoming increasingly popular. So much so that getting your dog out riding the waves is now considered a sport! Founded on the shores of Hawaii, dog surfing was officially launched in Australia as the feature attraction at the 2012 Noosa Festival of Surfing. 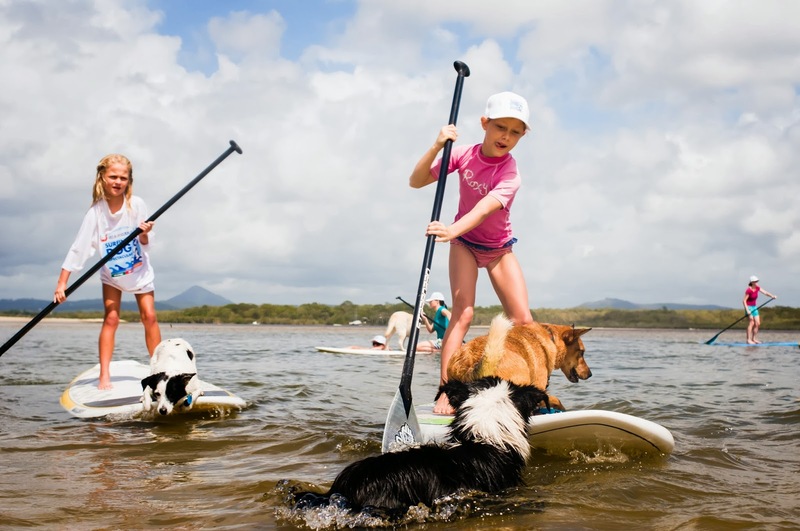 Now in its third year, the VetShopAustralia.com.au Surfing Dog Spectacular is the main attraction of the Noosa Festival of Surfing, attracting large crowds; even more than the professional surfing events! Chris De Aboitiz, former tandem world surfing champion and professional dog trainer has been involved in the event since its inception and believes that dog surfing is a great way to spend quality time with your dog while you are doing something you both love. For those of you who want to experience the sun, surf and sand with your pooch, Chris has provided us with some simple steps to follow to get your dog on a board and out into the waves. How to teach your dog to surf. 1. First, put your dog in a ‘sit and stay’ position on the beach. 2. Now invite your dog onto the board. Once on the board get them back in the ‘sit & stay’ position. 3. Let your dog stay there for a few moments then invite them off the board. Use a lead if required. 4. Put your board by the water’s edge and invite your dog onto it then slide your board into the water with your dog staying on the board in a ‘sit’ position. 5. Let your dog float around on the board for a few minutes and then bring it back onto the beach. Invite your dog off the board. 6. Congratulations! You’re now ready to take your dog for a paddle in the flat water. 7. Paddle your dog to a ‘happy place’ – for example a sand bar where you can run and play with your dog. 8. After one or two trips you’ll have trouble keeping your dog off the board! Chris and his pack of surfing dogs will once again be appearing at this year’s 2014 VetShopAustralia.com.au Surfing Dog Spectacular on Sunday 9th March, First Point, Noosa. Come along and be amazed and entertained at the skill level of these hot-dogging dogs; you’d be barking mad to miss it!